These healthy banana muffins are my all time favourite! I just love this muffin recipe. I have given it to so many people over the years as everybody just loves them. I think it is pretty much flop-proof so anyone who has never baked before can make these with such ease. For a bit of variety you can try adding some nuts or different seeds and raisins. You could even try adding some dried apricots cut into little pieces or try a mixture of grated apple and mashed banana. The options are endless. These muffins are really healthy snacks for kids and can become part of your breakfast recipes collection too as they can be a great addition to a quick healthy breakfast - just grab one on the run. 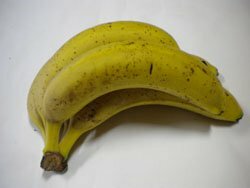 I don't konw about you, but I often have bananas that have become over-ripe and am always looking for banana recipes so that I can use up my over-ripe bananas. This is a great recipe for using those ripe bananas. I've even discovered that I can put my ripe bananas in the freezer and use them when I need them. 2. Mix the sugar & eggs together, then add the oil and milk. 3. Add all the dry ingredients and mix together. You may need to add some extra milk to get a good consistency. It mustn’t be stiff at all. 4. Spoon the mixture into the muffin trays. 5. Bake for about 20 minutes/until done. Enjoy it! I really hope that you love this recipe as much as I do. Here is a list of some more banana muffin recipes for you to try. They are all really easy to make and taste delicious.